Chances are 70% of Matric learners have Mobile Smartphones that have access to internet and it is a great advantage to get information very easy. 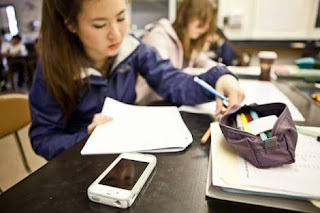 Mobile technologies can support and enrich learning. Pupils are no longer restricted to rely on physical lecture and textbooks for information bit they are able to do their own research. With more people using the mobile devices to access information ,mobile learning is becoming the norm and if used for good it can be a great advantage to develop our education. Most learners forget a percentage of what they learn during a training session but with mobile learning they have access to information every where they go and they can practice with other learners without having to travel or meet. Mobile learning doesn't replace face to face tutoring classes but it can help learners to get access to more information .